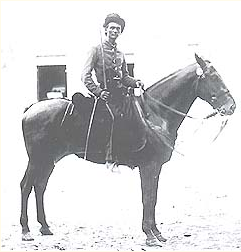 Lt. Nathan M. Robertson, on horseback and equipped with a Confederate halter-bridle and an 1850 British Army light cavalry hussar’s saddle–an item that came right through the blockade. This is one of the few known war-era images of a mounted Confederate cavalryman. Photo courtesy the Atlanta History Center. It is well known that the Southern Confederacy relied on foreign imports for a significant amount of its arms and material needs during the War between the States. Much less renown is the fact that foreign supply was also an important source of saddlery and horse equipments intended for the Confederate Army’s Officer Corps. Prior to the war the great European armies, their tactics, arms and equipments were held in high regard by the American military establishment in Washington. Europe was then at the pinnacle of her world military power so when the war began it was natural for the new Southern Confederacy to look there for assistance in its supply of arms and material including horse equipments. This was particularly true of England which had long held a major influence over the development of American saddlery. Though there is evidence harness and other equipments were purchased from France and possibly Belgium or even Germany, it was the British Army Cavalry saddles and tack of the period that became the foremost of the foreign military horse equipments imported by the South for use by its officers during the War Between the States. Almost immediately after the firing on Ft. Sumter Confederate President Jefferson Davis sent University of Alabama instructor and West Point graduate, Caleb Huse to England to purchase arms and equipment for the War Department. Over the next three years Major Huse worked under the authority of Ordnance Bureau Chief, Col. Josiah Gorgas to procure and arrange shipping of large quantities of arms, equipments, clothing, material resources and other supplies not readily available in the Confederacy. At first, purchasing and financial arrangements were difficult but soon Huse was able to secure a satisfactory, though often tenuous relationship with the Liverpool firm of Fraser, Trenholm and Company to finance most of his purchases using cotton as a basis of credit. Long term contracts were placed almost entirely in the hands of the London commission house of Saul Isaac, Campbell and Company. This firm became a major part of the Confederate government’s supply operations abroad providing by wars end, the largest portion of its foreign military equipments. Though other minor War Department agents and several civilian enterprises also dealt in blockade running during the war it was Major Huse and the Ordnance Department that handled the majority and most successful of the Confederate government’s overseas trade. The story of the Confederacy’s foreign purchasing operations is an interesting tale of clandestine characters, compounding diplomatic and fiscal relationships involving both great detail and intrigue that is largely ignored by historians. However, it is also one of considerable accomplishment. Chiefly through Gorgas and Huse’s efforts the Ordnance Bureau established an admirable, if not amazing record for purchasing not just arms, equipments, gun powder, lead, machinery, food, clothing, medical and other supplies but even the unique ships required to run them through the blockade. Without such trade it is highly doubtful the Confederacy could have survived for as long as it did. These successes become all the more extraordinary when one considers that they were performed under the burden of purchasing goods on credit basis, for a newly created nation’s government then struggling in a war for its very existence! Lt. Gen. T.J.”Stonewall” Jackson’s imported British Hussar’s pattern saddle displayed on Jackson’s horse Little Sorrell at the Virginia Military Institute Museum in Lexington, Virginia. Photo by author, courtesy Col. Keith Gibson, VMI Museum. England. He even purchased a U.S. McClellen saddle from New York for a pattern as he considered it superior to any of the European military models then in use. However, this idea does not seem to have come to any fruition. Instead, it appears Huse was able to purchase, probably through Isaac, Campbell & Co., large numbers of British Army Cavalry saddles and equipments. Like all goods purchased for the Confederacy at the time, horse equipments were shipped from England aboard sea-going vessels to the island ports of St. George, Bermuda and Nassau in the Bahamas where they were then transferred to special-made, quick, low-draft steamers for the final dash through the blockade. The Ordnance Bureau used several Southern ports for blockade running but Wilmington, N.C. was by far, their largest and most successful point of entry and departure until it fell in the closing weeks of the war. Research of Bureau records for the depot there indicate a considerable number of saddles, bridles, bits, saddle blankets, saddle cloths, artillery harness and some grooming equipments were imported. They were in the War Department’s very first shipment in August 1861 and remained a consistent item on blockade runner’s manifests throughout the war. While never as essential as arms, lead, saltpeter or blankets they were at times, given priority consideration by the Ordnance Bureau. Hussar’s pattern saddle used by Capt. Morgan of the 17th Lancers in the Charge of the Light Brigade at Balaklava in 1854. Note the similarities between this saddle and Gen. Jackson’s on the previous page. These are the same patterns. Photo courtesy Capt. J.M. Holtby of the Queen’s Royal Lancers Regimental Museum, Grantham Lincs, Great Britain. All horse equipments were shipped individually to the South in kegs, casks or boxes with the saddle blankets or numnahs (saddle pads) gathered in large bales. Upon arrival in the South they were sent by rail to various arsenals where they were packaged in sets for sale exclusively to Confederate officers. Confederate regulations required that all commissioned officers furnish their own horse equipments. This was customarily done by purchasing them through an arsenal, in person or by letter with enclosed payment, to the post’s Military Storekeeper. The equipments were then turned over or shipped “Express” rail to the officer. Captains, Lieutenants and Colonels respectively, appear to be the primary purchasers. Privates were not issued English equipments until the last months of the war when some Confederate Arsenals began purging their stores and issuing them to whomever they were requisitioned. At most arsenals both domestic-made and imported saddlery were available for sale. Army of Northern Virginia officers usually purchased theirs through the Richmond Arsenal choosing from the English saddles or, more likely, one of two basic styles of Jenifer Officer’s pattern saddles (later McClellen) routinely manufactured at the Clarksville Harness Shops. Western theater officers likewise purchased their equipments from the nearest major arsenal producing saddlery. Until early 1864, the domestic-made officer’s equipments were of better quality and sometimes adorned with fancy embellishments. Saddle equipments intended for General Officers were usually made of even a higher grade materials than that used for other officers. They were also allowed additional license to customized them when ordering. A “set” of imported English equipments generally, but not always, consisted of a new or “second hand” saddle with crupper and breast strap, bridle and numnah. It also often included a valise, blue saddle cloth, surcingle and sometimes a horseshoe case. The cost was $125 a set until January of 1864 when the Chief of Ordnance directed they be sold for $160 each. Surviving correspondence indicates the English saddlery was highly regarded and much sought after by Confederate Officers. General Robert E. Lee thought they were of good quality and many other notable officers purchased and rode these saddle equipments including Major General Howell Cobb; Gen. Archibald Gracie; Col. W.P. Johnson of President Davis’s staff and other important commissioned Officers. One typical saddle of the kind can be found on display at the Virginia Military Institute Museum in Lexington, Va. On display with Major General T.J. “Stonewall” Jackson’s taxidermaled horse “Little Sorrel”. Made by “H. Peat, Saddler to her Majesty’s Cavalry” this early 1850’s pattern British Light Cavalry Officer’s saddle was given as a gift to the legendary Southern hero a few months before his death. The British Army of this period used a variety of different saddles for their General and Staff Officers, cavalry and artillery. Their Light and Heavy Cavalry regiments used a “Hussars” pattern saddle of Hungarian origins which differed from the rest of the mounted branches and even from unit to unit in various details. Thus, variations in saddlery were commonplace, even in what was then the world’s most modern army. After the Crimean War (1854-1856), the British Army standardized by adopting a new pattern “1856 Universal Saddle” (sometimes erroneously called the “Nolans” saddle) for both Light and Heavy Cavalry and began a drive toward re-outfitting their cavalry regiments. The reins, breast collar, and headstall from Capt. Morgan’s set of equipment. Photo courtesy Capt. J.M. Holtby of the Queen’s Royal Lancers Regimental Museum, Grantham Lincs, Great Britain. It remains difficult to determine from the available data which specific patterns of British saddles were most imported by the Confederacy. A few British artillery saddles and harness of the period were sent over yet their numbers were relatively small. More likely, the pre-Crimean War Light and Heavy Cavalry “Hussars” pattern saddles rendered obsolete by the changeover certainly were purchased by the South, as were probably at least some of the new model 1856 Universals obtained directly from government contract manufacturers- though their number may have been small. It is reasonable to assume that the new Universal Pattern saddles would be largely reserved for the British army. Given his frugal nature, Ordnance agent Huse probably found the availability and the price of the older models much more attractive, but this is merely speculative. In any event, the majority of the saddles imported by the Confederacy were probably of both basic 1850’s British army cavalry designs and possibly included some simple civilian patterns too. “Hussars” Pattern Saddles: The Light Cavalry saddles of the early 1850’s period usually had a high pommel and spoon cantle sometimes with brass edge overlay while those for the Heavy Cavalry often came without the spoon cantle. The major difference between the two was in weight which reflected their perspective roles in battle application- The Light Cavalry saddle weighed 19 lb, 9 oz., while the Heavy Cavalry saddle 10 lbs. Both were made of brown leather, with a fixed seat, panels (side bars) stuffed with horse hair, extended fans (side bars extending beyond the cantle), burs (side bars extending in front of pommel), optional knee rolls on the skirts, web or blue wool girth and iron Hussars stirrups. 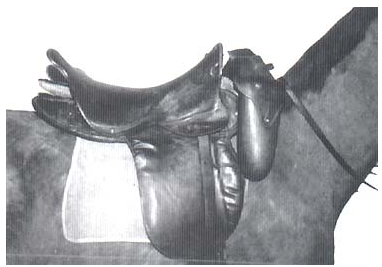 The 1856 “Universal” Pattern”: In general, the new pattern Universal saddle was a great improvement over the earlier patterns both in consistent qualitative construction and the fact it came in three different sizes for better fit to the horse. Its beechwood tree had a high front arch (pommel) and a high spoon cantle but without the brass overlay and not quite so upright as the earlier Hussars saddles. The front arch and cantle also had iron plate supports for added strength. The side boards were twenty-four inches long with slots for stirrup straps and the panels like earlier models, were heavily stuffed with horsehair. Traditional British military skirts of brown leather were connected to the seat which was also leather covered. The new saddle also retained the iron Hussars pattern stirrups. Weighing 15 lb, 8 oz. this saddle remained the primary British Army pattern in use until the 1870’s. 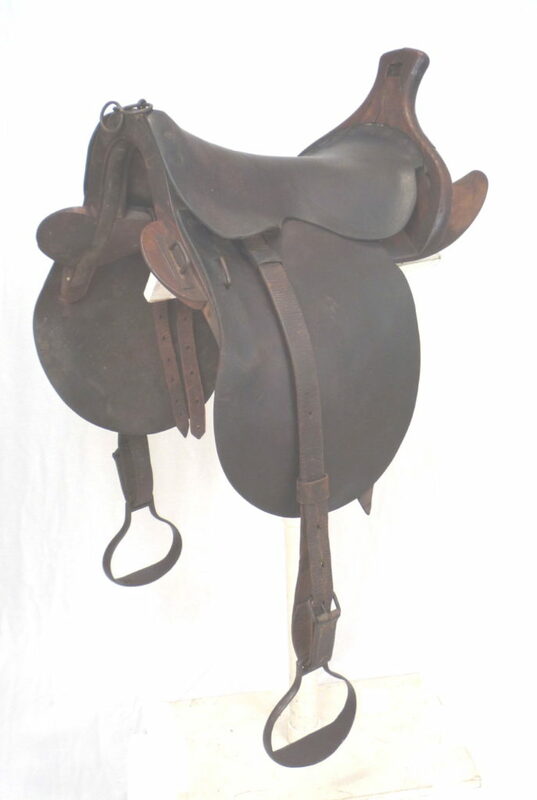 This saddle with its exposed wooden cantle, does not appear to have been received as favorably by Southern officers as had the earlier Hussar pattern saddles. English cavalry saddle blankets were of wool, usually natural white or brown in color and made large, sixty-five inches by fifty-six inches, for folding under the saddle sometimes in as many as sixteen folds. Confederate Ordnance records show only a very small number of “horse blankets” were imported as well as a few “grey” blankets, however large numbers of bales, simply described as “blankets” or “numnahs”, were shipped through the Blockade. Numnahs: The numnah was Russian in origin but was adopted by the British Army from India. Period British military numnahs were made of thick woolen or felt, cut to fit from the shoulder to the hips of the horse and meant to be worn under the saddle cloth cover. It weighed 5 lb, 6 oz. Several thousands of these were imported in “bales” by the Ordnance Bureau beginning early in the war through 1864. Numnahs were sold with each “set” of Officers equipments and replacements could be purchased- generally for $25 each. British numnahs and blankets may have been occasionally issued to privates when supplies permitted, particularly very late in the war when the arsenals were purging their stores. 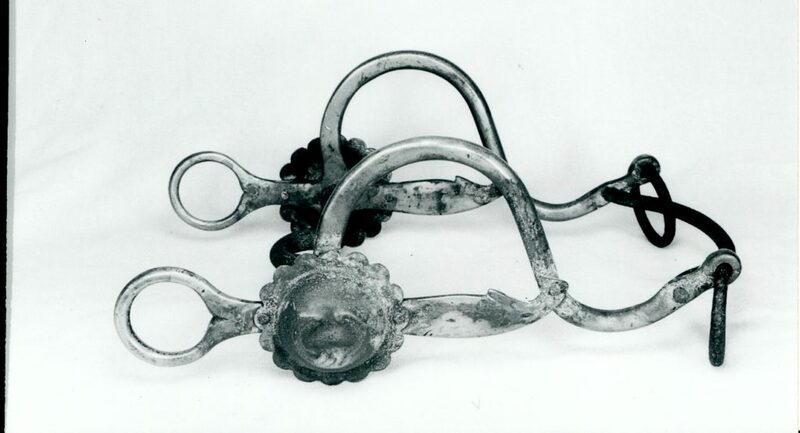 These English-made “pad” bits were typical issue to British cavalry of the period. However, the C bosses so often found on them are not British army and may have been specially made in England for Confederate officers. The one at top is a rare brass pad bit with “C” boss. Other similarly constructed pad bits are encountered in both excavated and non-excavated condition from CW battlefields with variations of brass bosses, such as the plain one above, or no bosses at all. Photos by author. Saddle Cloths: Blue cloth cover lined with leather, it was usually adorned with gold lace trimmings. Secured by a surcingle, it went over the saddle from front to rear including a tapered swallow tail which covered the flanks of the horse. This item often accompanied the set of equipments sold to Confederate Officers. British cavalry valises were a typically constructed, hollow cylinder made of leather and blue cloth with yellow trimmings. It is believed this item was often sold as part of a set of English equipments. 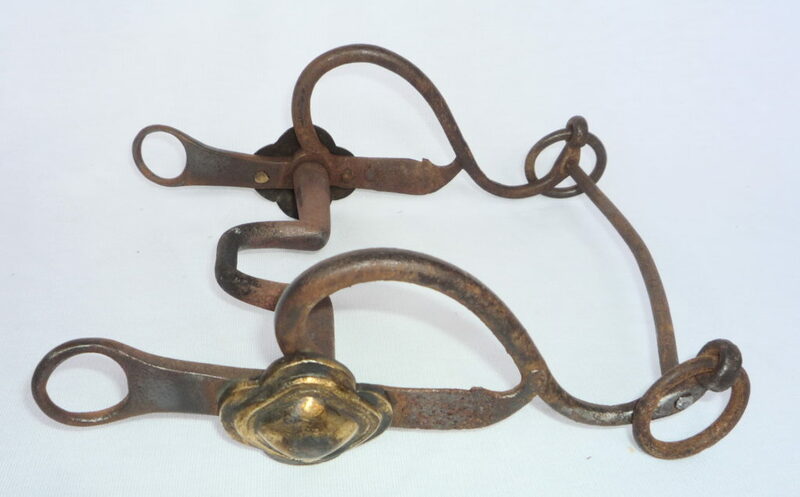 The period British Army bridle was in actuality, a halter-bridle. To Americans this headset, a copy of the Hungarian Hussars double-bridle style, was a baffling conglomeration of leather straps, buckles, rings, leather or web head collar, bridle headstall, curb bit with chain, bridoon and double reins. Until 1860, these were often additionally encumbered with very ornamental face pieces, fancy leather rosettes and hardware adding much unnecessary weight. While it is certain large numbers of English bridles were imported by the South their configuration is not at all clear, yet like saddles they likely varied between the Light and Heavy Cavalry versions and the British army’s new standardized 1860 pattern bridle or even civilian models. Significant numbers of English bits were imported by the South during the war, however it is impossible to determine all of their configurations. A number of British military “pad cheek” (1860 British Universal pattern) curb bits have survived or been excavated from war sites, many with the English script “C” brass bosses; plain brass bosses or with no bosses at all. The evidence suggests the pie-crust “C” bosses were cast in England for the Confederacy then attached to these bits before shipment to the South. However, other military pad cheek bits with Royal cipher brass bosses (During Queen Victoria’s reign they are identified with the Latin words “Honi Soit Qui Mal Y Pense” , a co-joined “VR” in script lettering and Royal crown) and numerous period civilian style English bit variations such as the Pelham, Snake Cheek, Buxton and others are also found in the United States but their Confederate lineage is speculative. Whatever their appearance, a bridle with bit was almost always sold as part of the saddle set. The 1853 French artillery bit. A small number of these almost certainly came to the South through the Blockade with French artillery harness purchased by Caleb Use. Others likely filtered into the US following the French effort by Napoleon III to install Maximilian as the monarch of Mexico. This pattern of bit was in common use by France into WW II, and it is a certainty that still more came home as souvenirs with the American Doughboys. Photos by author. English-made stable requisites were popular in America during the 1840’s and 1850’s and continued to be imported by both sides during the conflict. Some British horse brushes of the period were of brown leather often with the maker’s name in relief or possibly the Royal crest of Queen Victoria. One common pre-war pattern curry comb with English origins and often duplicated by American manufacturers, can be identified by its brass disk embossed with the numbers “222″ or “333.” The Confederacy had considerable difficulties manufacturing their own adequate supply of brushes and combs. Records show some were imported but their numbers were relatively small. MISCELLANEOUS: Significant amounts of other goods used in the domestic manufacture of horse equipments were also imported from England. These include hardware such as rings and buckles, linseed oil, white lead paint, sewing awls, thread and very large quantities of leather. The majority of these items were sent to the Richmond Arsenal ultimately for use in the Army of Northern Virginia. English Hussar’s pattern stirrups commonly issued with British artillery and cavalry saddles. The one at left was excvated in North Carolina, the one at right from a battlesite near Richmond. Photos by author. Surviving Confederate records are woefully incomplete so there is no accurate way to determine the number of British Cavalry horse equipments imported into the Confederacy during the war. Nevertheless, the evidence suggests they were considerable. A list of imported supplies provided to the Secretary of War by Colonel Gorgas indicates twelve hundred and twenty-six sets of cavalry equipments and thirteen hundred and sixty numnahs were run through the blockade prior to February 1863. However, due to lack of documentation and the inconsistent manner in which goods were routinely bulk packaged for shipment it is to difficult to resolve how many equipments arrived after this date. The import record book from the Bureau’s main port of entry at Wilmington, N.C. indicates approximately 55% of the boxes, kegs and bales of horse equipments received from July 1863 through January 1865 went to the Richmond Arsenal. Another 25% went to Augusta and the remainder to Macon, Atlanta and Columbia respectively. A smaller, though incalculable number of equipments likely came through other Southern ports. The Augusta Arsenal’s records of issuances are intact, though somewhat sketchy at war’s end, nevertheless, they clearly show a minimum of two hundred and one sets of English equipments were sold over this same period to Officers, generally in the Army of Tennessee. Using the above figures one can estimate that a low figure of 2,230 sets were imported by the South during the war however, a more accurate number is certainly higher. Whatever the figure, the documentation strongly suggests imported British army horse equipments played a greater role in mounting the Confederacy’s officers than had previously been granted. Which goes to further diversify the already complicated image of how the South equipped its armies. On a less serious note, in light of this evidence proving some Confederate officers were riding fancified imported English saddles, bridles, valises and gold trimmed saddle cloths, maybe some of those old Kurtz & Allison prints, long thought so horribly inaccurate, weren’t really so terrible after all! Note: The author wishes to thank Mr. Ralph Emerson, Col. Kieth Gibson of the V.M.I. Museum, Capt. J. M. Holtby of the Queens Royal Lancers Regimental Museum and Mr. Nick Nichols of Heartland House for their kind and substantial assistance in the completion of this article. 1. Post war photo of Confederate Purchasing Agent, Major Caleb Huse. Photo courtesy of the W.S. Hoole Special Collections Library, University of Alabama. 2. Lt. Gen. T.J. “Stonewall” Jackson’s imported British Cavalry saddle on display at the Virginia Military Institute Museum in Lexington, Va. Photo by author courtesy of Col. Kieth Gibson, V.M.I. Museum, Lexington, Va.
3. Saddle, bridle, breast collar and crupper used by Capt. Morgan of the 17th Lancers in the Charge of the Light Brigade at Balaklava in 1854. Note the similarity between this saddle and Gen. T.J. Jackson’s. Photo courtesy of Capt. J. M. Holtby of the Queen’s Royal Lancers Regimental Museum, Grantham Lincs, Great Britain. 4. 1856 Universal Pattern Saddle. Photo courtesy of the National Army Museum, London England. 5. English Hussar’s pattern stirrups commonly issued with British artillery and cavalry saddles. L- Dug in North Carolina; R- dug from the battlefields around Richmond. Photo by Author. 6. 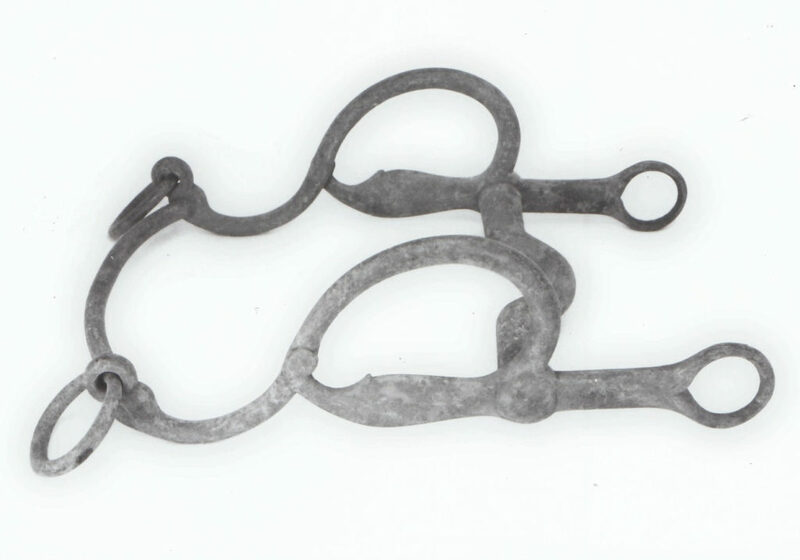 The English-made “Pad” bits were typical issue to British cavalry of the period. The “C” bosses are not British army and may have been special-made by Ordnance Bureau purchasing agents for Confederate Officers. Other similar-made “pad” bits are excavated or found in the United States with variations of brass bosses or no bosses at all. Photo courtesy of Steve Henry. 1. BRITISH CAVALRY EQUIPMENTS, 1800-1941. Osprey’s Men-At-Arms Series. By Mike Chappell. Ospry Publishing Ltd. London, England, 1983. 2. HORSES AND SADDLERY, by Major A. Tylden, Army Museums Ogilby Trust, London, 1965. 3. HISTORY OF THE BRITISH CAVALRY 1816 to 1919, Volume I 1816-1850 and Volume II 1851-1871. By The Marquess of Anglesey, Leo Cooper, London 1973 and 1975. 4. THE LORINER. OPINIONS AND OBSERVATIONS ON BRIDLE BITS AND THE SUITABLE BITTING OF HORSES WITH ILLUSTRATIONS, By Benjamin Latchford, Bridle-bit stirrup and spur maker to Her Majesty and The Prince of Wales. Nichols, Son & Co. London, 1870. Re-published in 1987 by Grasshopper Publishing Co. Valley Falls, KS. 5. A 17TH LANCER OF 1854 RECONSTRUCTED, By Alan Larsen. Military Illustrated Past & Present Magazine, January 1992. 6. THE SUPPLIES FOR THE CONFEDERATE ARMY, HOW THEY WERE OBTAINED IN EUROPE AND HOW PAID FOR. By Caleb Huse. T.R. Marvin & Son Press, Boston, 1904. Reprint by Deep River Armory, Inc. Houston Tex. 1970. Entry 39 Miscellaneous Records of the Ordnance Bureau. Vols. 90,91,91 ½, 92,93,96,97 Richmond Arsenal and Clarksville Depot. 8. NATIONAL ARCHIVES, M331, MILITARY SERVICE RECORDS, GENERAL AND STAFF OFFICERS, Capt. J. W. Archer (#9); Major William S. Downer (#78); Capt. Dinwiddie (#76); Col. Josiah Gorgas (#106); Major Caleb Huse (#137); Capt. John Payne (#194). 9. OFFICIAL RECORDS, Series IV, Vol. I, Pg. 538-542, 1005. Vol. II, Pgs. 227, 718-721, 955-956. Vol. III, Pg. 987-988. 10. ACCOUNT BOOK OF CAPT. JOHN M. PAYNE COMPRISING IMPORTED ORDNANCE STORES AT WILMINGTON 1863-1865. Eleanor S. Brockenbrough Library, Museum of the Confederacy, Richmond, Va.
11.PLOUGHSHARES INTO SWORDS, JOSIAH GORGAS AND CONFEDERATE ORDNANCE, By Frank E. Vandiver, University of Texas Press, Austin, 1952. 12. CONFEDERATE BLOCKADE RUNNING THRU BERMUDA, LETTERS AND CARGO MANIFESTS, By Frank E. Vandiver. University of Texas Press, Austin, 1947. 13. LIFELINE OF THE CONFEDERACY, BLOCKADE RUNNING DURING THE CIVIL WAR, By Stephen R. Wise. Univeristy of South Carolina Press, Columbia, 1988. 14. CONFEDERATE SUPPLY, By Richard D. Goff, Duke University Press, Durham, N.C., 1969. 15. IMPORTS OF THE CONFEDERATE GOVERNMENT FROM EUROPE AND MEXICO; By William Diamond, Journal of Southern History, VI, 1940, Pg. 470-503.